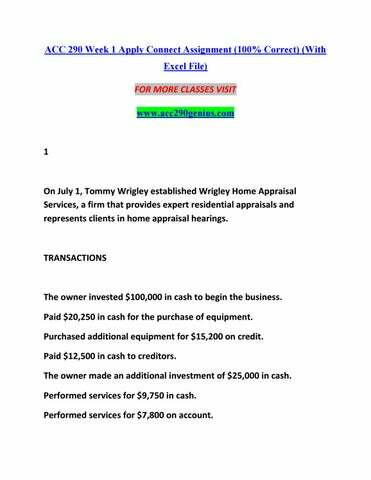 On July 1, Tommy Wrigley established Wrigley Home Appraisal Services, a firm that provides expert residential appraisals and represents clients in home appraisal hearings. The owner invested $100,000 in cash to begin the business. Paid $20,250 in cash for the purchase of equipment. Purchased additional equipment for $15,200 on credit. Paid $12,500 in cash to creditors. The owner made an additional investment of $25,000 in cash. Performed services for $9,750 in cash. Performed services for $7,800 on account. Paid $6,000 for rent expense. Received $5,500 in cash from credit clients. Paid $7,550 in cash for office supplies. The owner withdrew $12,000 in cash for personal expenses. Record in equation form the changes that occur in assets, liabilities, and ownerâ&#x20AC;&#x2122;s equity for the above transactions. What is the ending balance of cash after all transactions have been recorded? The following equation shows the transactions of Cotton Cleaning Service during May. The business is owned by Taylor Cotton. Analyze each transaction carefully. Prepare an income statement and a statement of owner’s equity for the month. Prepare a balance sheet for May 31, 2019. Complete the Week 1 Assignment in Connect. Harold Joseph is a painting contractor who specializes in painting commercial buildings. At the beginning of June, his firm’s financial records showed the following assets, liabilities, and owner’s equity. Performed services for $6,600 on credit. Paid $1,620 in cash for new office chairs. Received $10,400 in cash from credit clients. Paid $800 in cash for telephone service. Sent a check for $2,900 in partial payment of the amount due creditors. Paid salaries of $8,900 in cash. Sent a check for $1,040 to pay electric bill. Performed services for $9,700 in cash. Paid $2,270 in cash for auto repairs. Performed services for $11,700 on account. Enter the above transactions in to the following accounting equations. What is the amount of total assets after all transactions have been recorded? Complete the Week 1 Exercise in Connect®. Grades must be transferred manually to eCampus by your instructor. Donâ&#x20AC;&#x2122;t worry, this might happen after your due date. assets increase and owner’s equity decreases. liabilities decrease and owner’s equity increases. developing generally accepted accounting principles. establishing accounting systems for businesses. making recommendations to the Securities and Exchange Commission. suggesting actions to reduce tax liability. Which of the following equations is the Fundamental Accounting Equation? Identify the form of business that is considered a separate legal entity. Which of the following is NOT a service of public accounting firms? Which financial statement is reported as of a specific date? anyone in the accounting department. Month Ended November 30, 2019. Six-month Period Ended November 30, 2019.
an owner withdrawal for personal use. the receipt of cash from a credit customer. the payment of a creditor on account. the payment of the monthly utility bill. expenses increase and owner’s equity increases. assets and owner’s equity decrease. assets decrease and ownerâ&#x20AC;&#x2122;s equity increases. ownerâ&#x20AC;&#x2122;s equity decreases and revenue decreases. assets decrease and owner’s equity decreases. assets decrease and expenses increase. Income Statement; Statement of Owner’s Equity; Balance Sheet. Balance Sheet; Income Statement; Statement of Owner’s Equity. Income Statement; Balance Sheet; Statement of Owner’s Equity. Statement of Owner’s Equity; Balance Sheet; Income Statement. an amount a business must pay in the future. the payment of amounts owed to creditors. amounts earned from the sale of goods or services. the collection of amounts owed by customers. combined in the firmâ&#x20AC;&#x2122;s accounting records. combined only if the owner wants them to be. reported in different parts of the firmâ&#x20AC;&#x2122;s accounting records. kept totally and completely separate. Managerial accountants usually do which of the following? Which of the following is a true statement in regards to the International Accounting Standards Board? accounts receivable and rent expense. investments by the owner and revenue. The statement of financial position is another term for which financial statement? a formal report of business operations. The owner invested $100,000 in cash to begin the business. Paid $20,250 in cash for the purchase of equipment. Purchased additional equipment for $15,200 on credit. Paid $12,500 in cash to creditors. The owner made an additional investment of $25,000 in cash. Performed services for $9,750 in cash. Performed services for $7,800 on account. Paid $6,000 for rent expense. Received $5,500 in cash from credit clients. Paid $7,550 in cash for office supplies. The owner withdrew $12,000 in cash for personal expenses. Record in equation form the changes that occur in assets, liabilities, and ownerâ&#x20AC;&#x2122;s equity for the above transactions. On December 1, Kate Holmes opened a speech and hearing clinic. During December, her firm had the following transactions involving revenue and expenses. Provided services for $2,800 in cash. Paid $800 for telephone service. Paid salaries of $2,600 to employees. Provided services for $3,000 on credit. Paid $450 for office cleaning service. Did the firm earn a net income or incur a net loss for the period? What was the amount? At the beginning of September, Selena Cantu started Cantu Wealth Management Consulting, a firm that offers financial planning and advice about investing and managing money. On September 30, the accounting records of the business showed the following information. Prepare an income statement for the month of September 2019. The fundamental accounting equations for several businesses follow. Supply the missing amounts. Prepare a statement of ownerâ&#x20AC;&#x2122;s equity for the month of September and a balance sheet for Cantu Wealth Management Consulting as of September 30, 2019. Taylor Equipment Repair Service is owned by Jason Taylor. Use the above figures to prepare a balance sheet dated February 28, 2019. What is the net worth, or owner’s equity, at February 28, 2019, for Taylor Equipment Repair Service? Complete the Week 1 Knowledge Check in Connect®. Note: You have unlimited attempts available to complete this practice assignment. The highest scored attempt will be recorded. assets and ownerâ&#x20AC;&#x2122;s equity increase. owner’s equity decreases and revenue decreases. transactions for Randy Guttery, Landscape Consultant took place during the month ended June 30, 2019. The following transactions are for Randy Guttery, Landscape Consultant. Paid $5,600 for the current monthâ&#x20AC;&#x2122;s rent. Post the above transactions into the appropriate T accounts. The following occurred during June at Hicks Family Counseling. Delivered monthly statements, collected fee income of $26,500. Paid the current monthâ&#x20AC;&#x2122;s office rent of $3,900. Completed professional counseling, billed client for $4,100. Client paid fee of $2,100 for weekly counseling, previously billed. Paid office salaries of $3,500. Paid telephone bill of $470. Billed client for $3,100 fee for preparing a counseling evaluation. Purchased office supplies of $990 on account. Collected $3,100 from client who was billed. Clients paid a total of $9,200 cash in fees. The following transactions took place at Calhoun Counseling Services, a business established by Ronald Calhoun. Ronald Calhoun invested $63,000 cash in the business. Purchased office furniture for $16,300 in cash. Bought a fax machine for $980; payment is due in 30 days. Purchased a used car for the firm for $16,300 in cash. Calhoun invested an additional $10,300 cash in the business. Bought a new computer for $3,300; payment is due in 60 days. Paid $980 to settle the amount owed on the fax machine. Calhoun withdrew $4,300 in cash for personal expenses. ACC 290 Week 2 Apply: Connect® Exercise Review the Knowledge Check in preparation for this assignment. Complete the Week 2 Exercise in Connect®. an expense with a credit balance. a liability with a debit balance. an asset with a debit balance. an expense with a debit balance. Which of the following accounts have normal credit balances? The Net Income appears as a separate line item on what two statements? increase side of the account. the left side of the account. decrease side of the account. the right side of the account. Which of the following transactions increase ownerâ&#x20AC;&#x2122;s equity? Which of the following represents the proper sequence for preparing the financial statements? a revenue with a debit balance. an asset with a credit balance. debit Accounts Receivable and credit Cash. debit to Accounts Payable and credit Cash. debit Supplies and credit Accounts Payable. debit Cash and credit Supplies. Which of the following does NOT describe a transposition? It involves misplaced digits in a number. It causes the difference between the debit total and the credit total to be divisible by 2. It causes the trial balance to be out of balance. Which of the following would cause the Debit column and the Credit column of the Trial Balance to be unequal? Which of the following accounts is NOT a nominal account? on the left side of the Cash account and the right side of the Accounts Receivable account. on the left side of the Cash account and the left side of the Accounts Receivable account. on the left side of the Accounts Payable account and the right side of the Cash account. on the left side of the Cash account and the right side of the Fees Income account. Which of the following entries records the withdrawal of cash for personal use by Ty Knott, the owner of a business? is $20,450 and would be recorded on the right side of the account. is $52,950 and would be recorded on the left side of the account. is $20,450 and would be recorded on the left side of the account. is $52,950 and would be recorded on the right side of the account. On a statement of ownerâ&#x20AC;&#x2122;s equity, beginning capital is $152,000, Drawing for the year is $65,000, and the ending capital is $191,000. What is the amount of Net Income for the year? decreases in assets and owner’s equity and increases in liabilities. decreases in liabilities and increases in assets and owner’s equity. increases in liabilities and revenues. increases in assets, liabilities, and owner’s equity. income statement and the statement of owner’s equity. statement of owner’s equity and the balance sheet. only on the balance sheet. Which of the following would cause the Trial Balance to be out of balance? Select the entry below to record the payment to employees for work performed during the pay period? Complete the Week 2 Practice in Connect. The following T accounts show transactions that were recorded by Residential Relocators, a firm that specializes in local housing rentals. The entries for the first transaction are labeled with the letter (a), the entries for the second transaction with the letter (b), and so on. Derrick Wells decided to start a dental practice. The first five transactions for the business follow. Derrick invested $45,000 cash in the business. Paid $15,000 in cash for equipment. Performed services for cash amounting to $4,500. Paid $1,900 in cash for advertising expense. Paid $1,500 in cash for supplies. (1) Select which two accounts are affected in each of the above transactions. (2&3) Post the above transactions into the appropriate T accounts. The accountant for the firm owned by Randy Guttery prepares financial statements at the end of each month. The following transactions for Randy Guttery, Landscape Consultant took place during the month ended June 30, 2019. The following transactions are for Randy Guttery, Landscape Consultant. Guttery invested $80,000 in cash to start the business. Paid $3,000 for the current monthâ&#x20AC;&#x2122;s rent. Bought office furniture for $8,360 in cash. Performed services for $4,100 in cash. Paid $625 for the monthly telephone bill. Performed services for $7,000 on credit. Purchased a computer and copier for $19,000; paid $6,500 in cash immediately with the balance due in 30 days. Received $3,500 from credit clients. Paid $2,000 in cash for office cleaning services for the month. Purchased additional office chairs for $2,900; received credit terms of 30 days. Purchased office equipment for $20,000 and paid half of this amount in cash immediately; the balance is due in 30 days. Issued a check for $4,700 to pay salaries. Performed services for $7,250 in cash. Performed services for $8,000 on credit. Collected $4,000 on accounts receivable from charge customers. Issued a check for $1,450 in partial payment of the amount owed for office chairs. Paid $350 to a duplicating company for photocopy work performed during the month. Paid $610 for the monthly electric bill. Guttery withdrew $4,500 in cash for personal expenses. The following T accounts show transactions that were recorded by Residential Relocators, a firm that specializes in local Housing rentals. Prepare a statement of ownerâ&#x20AC;&#x2122;s equity and a balance sheet for Residential Relocators as of December 31, 2019. Prepare a trial balance and an income statement for Residential Relocators. The trial balance is for December 31, 2019, and the income statement is for the month ended December 31, 2019. The accountant for the firm owned by Randy Guttery prepares financial statements at the end of each month. The following transactions for Randy Guttery, Landscape Consultant took place during the month ended June 30, 2019. Prepare a trial balance, an income statement, a statement of owner’s equity, and a balance sheet. Assume that the transactions took place during the month ended June 30, 2019. Determine the account balances before you start work on the financial statements. ACC 290 Week 2 Practice: Connect® Knowledge Check Complete the Week 2 Knowledge Check in Connect®. The transactions that follow took place at the Desoto Recreation and Sports Arena during September 2019. This firm has indoor courts where customers can play tennis for a fee. It also rents equipment and offers tennis lessons. a debit to Cash for $3,500, a debit to Accounts Receivable for $1,500 and a credit to Capital for $5,000. a debit to Cash for $3,500 and a credit to Fees Income for $3,500. a debit to Cash for $3,500; a debit to Accounts Receivable for $1,500 and a credit to Fees Income for $5,000. a debit to Fees Income for $5,000, a credit to Cash for $3,500 and a credit to Accounts Receivable for $1,500. Listed below in random order are the steps in the accounting cycle. What is the proper order of these steps? (2), (3), (4), (1) (3), (2), (4), (1) (4), (3), (2), (1) (3), (2), (1), (4) Bertrand Inc. purchased some shop equipment for $4,500 in cash. By mistake, the journal entry debited the Office Equipment account rather than the Shop Equipment account. What correcting entry would be necessary? Paid October office rent of $4,000; issued Check 1001. Issued Check 1002 for $4,100 to purchase art equipment. Purchased supplies for $1,670; paid with Check 1003. Issued Check 1004 for $800 for office cleaning service. Returned damaged supplies for a cash refund of $300. Performed services for $4,800 on credit. Paid $375 for monthly telephone bill; issued Check 1007. Received $4,200 in cash from credit customers. Mailed Check 1008 to pay the monthly utility bill of $1,080. Issued Checks 1009â&#x20AC;&#x201C;1011 for $9,000 for salaries. Performed services for $4,000 in cash. Performed services for $2,950 on credit. Paid $900 for monthly telephone bill; issued Check 1170. Paid for equipment repairs of $1,050 with Check 1171. Received $1,500 on account from credit clients. Issued Checks 1172â&#x20AC;&#x201C;1177 for $5,200 for salaries. Issued Check 1178 for $2,700 to purchase supplies. 19 Purchased new tennis rackets for $3,250 on credit from The Tennis Supply Shop; received Invoice 3108, payable in 30 days. Issued Check 1179 for $3,820 to purchase new nets. Received $500 on account from credit clients. Performed services for $3,480 in cash. Performed services for $5,050 on credit. Issued Check 1180 for $620 to purchase supplies. Paid the monthly electric bill of $2,500 with Check 1181. Issued Checks 1182â&#x20AC;&#x201C;1187 for $5,200 for salaries. 30 Issued Check 1188 for $5,000 cash to Ellis Carter for personal expenses. Selected activity of Mason Consulting Services follow. Zack Mason invested $30,000 in cash to start the firm. 4 Purchased office equipment for $3,250 on credit from Den, Inc.; received Invoice 9823, payable in 30 days. 16 Purchased an automobile that will be used to visit clients; issued Check 1001 for $15,000 in full payment. 30 Issued Check 1003 for $2,100 to Den, Inc., as payment on account for Invoice 9823. Withdrew $1,500 in cash for personal expenses. Performed services for $7,325 in cash. Paid $220 for monthly telephone bill, Check 1005. Post the above transactions into the appropriate Ledger accounts. The following transactions took place at the Cook Employment Agency during November 2019. Nov. 5 Performed services for Job Search, Inc., for $20,000; received $9,500 in cash and the client promised to pay the balance in 60 days. 18 Purchased a graphing calculator for $450 and some supplies for $600 from Office Supply; issued Check 1008 for the total. issued Check 1009 for half the amount and arranged to pay the other half in 30 days. Selected activity of the Ray Shipping Service follow. Sent a check for $1,050 to the utility company to pay the monthly bill. Provided services for $7,800 on credit. Purchased new equipment for $4,600 and paid for it immediately by check. Issued a check for $3,500 to pay a creditor on account. Performed services for $15,250 in cash. Collected $6,250 from credit customers. Purchased supplies for $3,250 on credit. Issued a check for $3,750 to pay the monthly rent. 4 Purchased office equipment for $3,250 on credit from Den, Inc.; received Invoice 9823, payable in 30 days. 16 Purchased an automobile that will be used to visit clients; issued Check 1001 for $15,000 in full payment. Complete the Week 3 Knowledge Check in Connect®. a debit to Equipment for $100 and a credit to Accounts Payable for $400. debit to Equipment for $500 and a credit to Cash for $500. a debit to Equipment for $500, a credit to Cash for $100, and a credit to Accounts Payable for $400. a debit to Equipment for $100 and a credit to Cash for $100. Compound entries include only debits. Accounts being debited should always follow the accounts being credited in a compound entry. All transactions require compound entries. after each amount is posted. as the transaction is journalized. after all entries on the journal page have been posted. as the first amount written in the journal. a debit to Fees Income and a credit to Cash. a debit to Cash and a credit to Accounts Receivable. alphabetical order. dollar amount order. chronological order. randomly. When recording a business transaction into the general ledger, certain steps are followed. Identify the statement below that is NOT CORRECT regarding this process. After posting a transaction, the new balance in an account can be seen in the general ledger. The process of transferring data from the journal to the ledger is called posting. All transactions are recorded first in the general journal and then they are transferred to the general ledger. All transactions are recorded first in the general ledger and then they are transferred to the journal. When recording a business transaction into the journal, certain steps are followed. Identify the statement below that is CORRECT regarding the journalizing process. All transactions are recorded first in the general ledger and then they are journalized in the journal. All credited accounts are listed first and then all debited accounts are indented and listed on the next lines. An explanation is indented and entered on the line underneath the last credit in the entry. No dates are used in the journal. Constantine Corporation reported Net Income for the year ended December 31, 2019, of $23,760 then discovered that the entry to pay the rent for December in the amount of $1,600 was not journalized and posted. What is the Net Income after the correcting journal entry is journalized and posted? $20,560 $23,760 $22,160 $25,360 Which of the following statements is NOT correct? If goods are purchased on credit, the supplierâ&#x20AC;&#x2122;s invoice number is used as the source document for the transaction. The description of a journal entry should include a reference to the source of the information contained in the entry. The credit portion of a general journal entry is always recorded first. A firm should be able to trace amounts through the accounting records and back to their source documents. Bertrand Inc. performed services for clients in the amount of $1,350 on credit. If this transaction had been posted in error to the Cash account instead of the Accounts Receivable account, what correcting entry would be necessary? Debit Fees Income $2,500; Credit Accounts Receivable $2,500 Debit Cash $1,000; Credit Fees Income $1,000 Debit Cash $1,000; Debit Accounts Receivable $1,500; Credit Fees Income $2,500 Debit Fees Income $2,500; Credit Cash $1,000; credit Accounts Receivable $1,500 Which of the following statements is CORRECT? Some companies use the general ledger instead of a general journal. The general ledger contains the accounts that are used to prepare the financial statements. When entries are posted from the general journal to the general ledger, the account number is written in the Posting Reference column in the general ledger. When entries are posted from the general journal to the general ledger, the page number is written in the Posting Reference column in the general journal. If an error in a journal entry is discovered before the entry is posted to the general ledger, a journal entry should be made to correct the erroneous entry. If an error in a journal entry is discovered before the entry is posted to the general ledger, the error in the entry should be crossed out and the correct data written above it. All errors made in journal entries should be corrected by the preparation of a correcting journal entry. If an error in a journal entry is discovered before the entry is posted to the general ledger, the entry can simply be erased and replaced with the correct journal entry. a $24,700 credit balance. a $23,700 credit balance. a $19,300 debit balance. a $24,700 debit balance. Bertrand Inc. purchased some shop equipment for $4,500 in cash. By mistake, the journal entry debited the Office Equipment account rather than the Shop Equipment account. What correcting entry would be necessary? first the temporary accounts, then the permanent accounts. first the accounts with debit balances, then the accounts with credit balances. first the accounts used most often, then those used less frequently. first the balance sheet accounts, then the income statement accounts. a debit to Equipment for $15,000, a credit to Cash for $1,000 and a credit to Accounts Payable for $14,000. a $13,000 debit balance. a $3,000 debit balance. a $27,000 debit balance. a $17,000 debit balance. Which of the following statements is CORRECT? a $24,700 debit balance. a $19,300 debit balance. a $23,700 credit balance. the first account entered should be indented. asset accounts should be indented. the accounts to be credited should be indented. liability, capital, and revenue accounts should be indented. When recording a business transaction into the journal, certain steps are followed. Identify the statement below that is CORRECT regarding the journalizing process. All transactions are recorded first in the general ledger and then they are journalized in the journal. No dates are used in the journal. An explanation is indented and entered on the line underneath the last credit in the entry. Complete the Week 4 Assignment in Connect. Paula Judge owns Judge Creative Designs. The trial balance of the firm for January 31, 2019, the first month of operations, is shown below. a. Supplies were purchased on January 1, 2019; inventory of supplies on January 31, 2019, is $1,500. b. The prepaid advertising contract was signed on January 1, 2019, and covers a four-month period. 2. Prepare an income statement, statement of ownerâ&#x20AC;&#x2122;s equity, and balance sheet. No additional investments were made by the owner during the month. If the adjusting entries had not been made for the month, would net income be overstated or understated? The trial balance of Neal Company as of January 31, 2019, after the company completed the first month of operations, is shown in the partial worksheet below. 2. Complete the worksheet by making the following adjustments: supplies on hand at the end of the month, $7,000; expired insurance, $6,900; depreciation expense for the period, $3,000. Complete the Week 4 Exercise in Connect®. a $8,000 debit to Rent Expense. a $8,000 credit to Rent Expense. a $4,000 credit to Prepaid Rent. a $24,000 credit to Cash. During its first year of business, XYZ Inc. purchased $1,600 of supplies. By the end of the year, only $500 of supplies remain in the supply cabinet. Determine the amount to be reported in the Supplies account in the Adjusted Trial Balance section of the worksheet prepared on December 31.
a debit to Prepaid Advertising and a credit to Advertising Expense. a debit to Advertising Expense and a credit to Accumulated Depreciation. a debit to Prepaid Advertising and a credit to Accumulated Depreciation. a debit to Advertising Expense and a credit to Prepaid Advertising. Which of the following statements is correct? as a contra-asset on the Balance Sheet. as an expense on the Income Statement. Complete the Week 4 Practice in Connect. On June 1, 2019, the firm bought supplies for $10,250. The $10,250 was debited to the Supplies An inventory of supplies at the end of June showed that items costing $5,960 were on hand. On June 1, 2019, the firm bought equipment costing $72,900. The equipment has an expected useful life of 9 years and no salvage value. The firm will use the straight-line method of depreciation. The completed worksheet for Cantu Corporation as of December 31, 2019, after the company had completed the first month of operation, appears below. Complete the Week 4 Knowledge Check in Connect®. supplies determined that only $350 of supplies actually remain in the supply cabinet. Select the adjusting entry made on December 31, to record the amount of supplies that had been used during the year. On January 1, 2019, Johnson Consulting purchased a truck for $18,000. The truck is expected to last 60 months and have no salvage value. Calculate the book value of the truck on December 31, 2020.
a $8,000 debit to Rent Expense. a $8,000 credit to Rent Expense. a $4,000 credit to Prepaid Rent. a $24,000 credit to Cash. Which of the following entries records the depreciation on equipment for the fiscal year-end adjustment? Debit Depreciation Expense; credit Equipment On July 1, Sidney Consulting Services paid $18,000 for 12 months of advance rent on its office building. Select the adjusting entry made on December 31, to record the amount of rent that had expired during the year. a debit to Insurance Expense and a credit to Accumulated Depreciation. a debit to Insurance Expense and a credit to Prepaid Insurance. a debit to Accumulated Depreciation and a credit to Prepaid Insurance. a debit to Prepaid Insurance and a credit to Accumulated Depreciation. an addition to expenses on the Income Statement. a deduction from assets on the Balance Sheet. an addition to assets on the Balance Sheet. a deduction of Capital on the Statement of Ownerâ&#x20AC;&#x2122;s Equity. Which of the following statements is correct? the Balance Sheet Debit column. the Income Statement Debit column. the Income Statement Credit column. the Balance Sheet Credit column. Which of the following need not be completed separately if a worksheet is prepared? The total assets on the balance sheet was $128,800 before journalizing and posting the adjusting entries for $800 of expired insurance, $2,400 of expired rent and $900 of depreciation. What are the total assets after journalizing and posting the adjusting? debit Supplies $2,100; credit Supplies Expense $2,100 debit Supplies Expense $2,100; credit Supplies $2,100 debit Supplies Expense $2,800; credit Supplies $2,800 debit Supplies Expense $700; credit Supplies $700 Which of the following statements is not correct? Salvage value is computed by subtracting the accumulated depreciation from the cost of a long-term asset. the financial statements are prepared using the worksheet data. preparation of the financial statements is not required. the adjusting entries do not need to be journalized. only a balance sheet is required. B. Consulting purchased a machine for $6,000 on August 1, 2019. The company expects the useful life of the machine to be 5 years and no salvage value is expected. If the company uses the straight-line method to depreciate the machine, what will be the depreciation adjustment for the year ending December 31, 2019? Debit Depreciation Expense $500 and Credit Accumulated Depreciation $500. Debit Depreciation Expense $500 and Credit Equipment $500. Debit Depreciation Expense $400 and Credit Accumulated Depreciation $400. Debit Accumulated Depreciation $100 and Credit Depreciation Expense $100. as a contra-asset on the Balance Sheet. as an expense on the Income Statement. as a liability on the Income Statement. a debit to Depreciation Expense and a credit to Equipment. a debit to Accumulated Depreciation and a credit to Equipment. a debit to Depreciation Expense and a credit to Accumulated Depreciation. 101 Cash $ 30,200 Dr. 111 Accounts Receivable 16,100 Dr. 121 Supplies 2,300 Dr. 131 Prepaid Rent 38,900 Dr. 141 Equipment 47,000 Dr. 142 Accumulated Depreciationâ&#x20AC;&#x201D;Equip. 1,150 Cr. 202 Accounts Payable 6,800 Cr. 301 Emilio Gonzalez, Capital (12/1/2019) 48,620 Cr. 302 Emilio Gonzalez, Drawing 6,500 Dr. 401 Fees Income 120,080 Cr. 511 Advertising Expense 4,100 Dr. 514 Depreciation Expenseâ&#x20AC;&#x201D;Equip. 830 Dr. 517 Rent Expense 2,900 Dr. 519 Salaries Expense 21,800 Dr. 523 Utilities Expense 6,020 Dr.
What is the balance of the Salaries Expense account after closing entries are posted? 2 A partially completed worksheet for At Home Pet Grooming Service, a firm that grooms pets at the ownerâ&#x20AC;&#x2122;s home, follows. What total debits were posted to the general ledger to complete all closing entries for the month of December? 3. A completed worksheet for The King Group is given below. Complete the Week 5 Exercise in Connect®. Select the correct closing entry that Gees Catering would make to close their revenue account(s) at the end of the accounting period. a debit balance. a credit balance. a negative balance. a zero balance. Which of the following accounts is not closed? ownerâ&#x20AC;&#x2122;s capital account. Cash account. Accounts Receivable account. Fees Income account. Which of the following accounts has a normal debit balance? Accounts Payable Fees Income Stark, Capital Which of the following accounts has a normal credit balance? Accounts Payable Accounts Receivable Supplies Expense Stark, Drawing Which of the following statements is correct? The Balance Sheet section of the worksheet contains the data that is used to make closing entries. The balance of the ownerâ&#x20AC;&#x2122;s drawing account will appear on the postclosing trial balance. Closing entries are entered directly on the worksheet. Record the adjusting entries in the general journal (transactions 1-3). Record the closing entries in the general journal (transactions 4-7). A partially completed worksheet for At Home Pet Grooming Service, a firm that grooms pets at the ownerâ&#x20AC;&#x2122;s home, follows. Post the adjusting entries and the closing entries to the general ledger accounts. Hint: Be sure to enter beginning balances. All accounts have normal balances. Post the transactions in to the appropriate ledger accounts. Hint: Be sure to enter beginning balances. The Income Summary and Linda Carter, Capital accounts for Carter Production Company at the end of its accounting period follow. On December 31, the Income Summary account of Madison Company has a debit balance of $111,000 after revenue of $117,000 and expenses of $228,000 were closed to the account. Madison Wells, Drawing has a debit balance of $12,000 and Madison Wells, Capital has a credit balance of $174,000. Record the journal entries necessary to complete closing the accounts. What is the new balance of Madison Wells, Capital? Complete the Week 5 Knowledge Check in Connect®. asset and liability accounts. revenue and expense accounts. liability and capital accounts. Identify the accounts below that are ALL classified as temporary accounts. debit Income Summary $47,000; credit Capital $47,000 debit Income Summary $41,000; credit Expenses $41,000 debit Capital $6,000; credit Income Summary $6,000 debit Income Summary $6,000; credit Drawing $6,000 Which of the following statements is not correct? debit Capital $11,000; credit Income Summary $11,000. debit Income Summary $11,000; credit Capital $11,000. debit Income Summary $11,000; credit Drawing $11,000. debit Revenue $64,000; credit Expenses $53,000. Listed below in random order are the steps in the accounting cycle. Has there been a lot of employee turnover? How much do customers owe the business? Has the business achieved its net income goal for the year? What are the businessâ&#x20AC;&#x2122; current and long term plans for expansion? Which of the following accounts is a permanent account? What is the amount that Gees Consulting would report as the ending balance in the R. Gees, Capital account at the end of the year? a debit to the Capital account and a credit to Cash. a debit to Income Summary and a credit to Capital. a debit to the Capital account and a credit to Income Summary. a debit to the Capital account and a credit to the Drawing account. Select the correct closing entry that Gees Catering would make to close the ownerâ&#x20AC;&#x2122;s withdrawal account at the end of the accounting period. the expense account(s). the capital account. the drawing account. the revenue account(s). Which of the following statements is correct? What is the amount that ABC Consulting would report as the ending balance in the B. Conway, Capital account at the end of the year? $22,100. $3,900 $31,000. $13,000. Trial balances are prepared in a certain order. Given the choices below, which one depicts the trial balances in the correct order in which they would be prepared? post-closing trial balance. balance sheet. income statement. worksheet. Which of the following statements is not correct? Depreciation Expense Capital Land Accounts Payable Which of the following entries records the closing of Penny Pincher, Drawing at the end of the accounting period? Accumulated Depreciation-Equipment. Depreciation Expense-Equipment. Equipment. Accounts Payable. Which of the following accounts will not normally have a zero balance after the closing entries have been posted? Fees Income Capital Rent Expense Income Summary Which of the following accounts has a normal credit balance? Select the correct closing entry that ABC Consulting would make to close the income summary account at the end of the accounting period. debit Income Summary $9,700 and credit B. Conway, Capital for $9,700. debit B. Conway, Capital $18,000 and credit Income Summary for $18,000. Select the correct closing entry that ABC Consulting would make to close their expense account(s) at the end of the accounting period. debit B. Conway, Capital $8,300 and credit Salary Expense $2,600; credit Rent Expense $3,000; credit Supplies Expense $1,900; Advertising Expense $800. debit Income Summary $8,300 and credit B. Conway, Capital for $8,300. debit Salary Expense $2,600; debit Rent Expense $3,000; debit Supplies Expense $1,900; debit Advertising Expense $800 and credit Income Summary $8,300. debit Income Summary $8,300 and credit Salary Expense $2,600; credit Rent Expense $3,000; credit Supplies Expense $1,900; Advertising Expense $800.